It is always nice to have some passion which brightens our day... for me, blogging is one of them! I can relate with you about your passion in crocheting sis! Kaso for now, I don;t have much time for my son if I go on my crocheting business so I just make it as my hobby. When I accept clients, I make sure na di ako mapepressure in meeting up the deadline. hehehe I make the deadline. 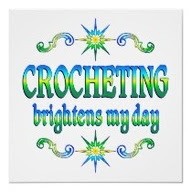 Happy Crocheting Mommy Maye! I can't wait to see your new creations. Hi sis! I have no idea with blankets pa pero you can search sa redheart.com for the free pattern or sa net.